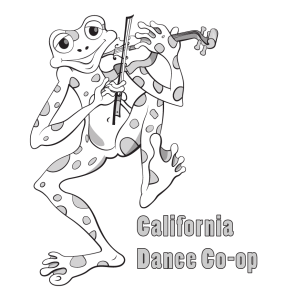 The name of this organization is the California Dance Co-operative (hereinafter referred to as the Co-op). The Co-op is a non-profit organization for educational purposes. The purpose of the Co-op is to promote the study, preservation and enjoyment of traditional and historical dance and music, primarily those of the United States, Canada and the British Isles. Groups whose activities promote the objectives of the Co-op may become affiliates. Such affiliation with the Co-op is exclusive of affiliation with any other organization, with the exception of the Country Dance and Song Society. Approval of affiliation requires a vote of two-thirds of the full Board of Directors (hereinafter referred to as the Board). The Co-op shall recognize one producer for each affiliate. The producer is the governing body or person that has the responsibility of running the activities of the affiliate. Any affiliate that changes its producer must notify the President in writing. It is the intention of the Co-op to allow each affiliate to operate as independently as possible within the constraints of the Co-op’s bylaws, policies, and non-profit status. Affiliates are required to operate in accordance with the directives and guidance of the Board. All events sponsored by affiliates must meet the requirements set forth by the Board. The Co-op shall maintain active supervision of the actions of each affiliate and, as the federally-recognized 501(c)3 organization, shall have responsibility for, and retain ownership of, the assets associated with the activities of the affiliate. The Co-op shall terminate affiliation with a group whose activities are not consistent with the purposes or the tax-exempt character of the Co-op. Any affiliate may be removed, after notice and opportunity to be heard, by a two-thirds vote of the full Board. Any affiliate may remove itself from the Co-op by submitting written notice to the President. When affiliation is terminated, assets related to the activities of the former affiliate shall be retained by the Co-op. The Board has sole responsibility and authority for all business matters of the Co-op. All powers and activities shall be exercised and managed directly by the Board or, if delegated, under the ultimate direction of the Board. The Board shall be composed of the dance producers, or their representatives, and two at-large members. Each Director shall have only one vote. The Board shall hold at least four regularly scheduled meetings per year, which shall be open to the general dance community. Special meetings may be called by the President or by any two Directors of the Board. Whenever these bylaws require that notification be provided, it shall be considered sufficient to deliver such notice by any means available. However, the notice shall be considered valid only if it is acknowledged by the recipient at least twenty-four (24) hours before the meeting. Directors may not vote by proxy. Two-thirds of the Directors in office as of the date of the meeting shall constitute a quorum. A meeting at which a quorum was initially present may continue to transact business, notwithstanding the withdrawal of Directors, if any action taken is approved by at least a majority of the required quorum for such meeting. Except as stated in the bylaws specifically, any act by a majority of the Directors present at a meeting is an act of the Board. At an annual meeting held in the fall, each affiliate dance producer shall nominate one Director, which may be her/himself. These Directors may serve as many terms as they desire, subject to renomination by the producer and approval by the Board. Two at-large Directors shall be nominated by the Board and approved by a majority vote of the full Board at the annual meeting. At-large Directors may not be dance producers, callers, musicians, or anyone in a position to derive financial advantage from the activities of the Co-op. At-large Directors may serve no more than five consecutive terms. All Directors’ terms of office run from January 1 through December 31 or until such time as the Board can meet. A Director may resign from the Board and leave a vacancy to be filled. Resignation shall be effective upon receipt of written notice by the President. A dance producer must nominate in writing a replacement representative to fill the remainder of the unexpired term. The replacement must be approved by a majority vote of the full Board. An at-large Director’s vacancy may be filled by the Board for the unexpired portion of the term. An affiliate producer shall not without just cause remove her/his representative to the Board except at the annual meeting. However, a Director may be removed by the Board if she/he has willfully violated the Bylaws, demonstrated gross negligence, or been absent for three consecutive meetings. A two-thirds vote of the full Board is required when removal is for cause. Directors may not be paid compensation for their services to the Board. Any Director shall have the right at any reasonable time to inspect and copy all books, records, and documents, and to inspect the physical properties of the Co-op. In the event of vacancies on the Board, the remaining Directors may exercise the powers of the full Board until the vacancies are filled. The officers shall consist of a President, Treasurer, Secretary, and such other officers as may, from time to time, be determined by the Board. he officers shall consist of a President, Treasurer, Secretary, and such other officers as may, from time to time, be determined by the Board. Only Board members may hold office. Officers shall be elected by a majority vote of the full Board. Officers shall be elected at an annual meeting held in the fall to serve a term from January 1 through December 31. Officers shall serve no more than five consecutive one-year terms. An officer may resign from her/his position by notifying the President and Secretary in writing. Any officer may be replaced at any time by a majority vote of the full Board. The President shall have general supervision of all business affairs, shall preside at Board meetings, and, with the Treasurer, shall sign all contracts for the organization. The Treasurer shall collect, deposit and disburse funds as directed by the Board; shall keep accurate financial and business records of the organization; shall prepare and submit an annual financial report to the Board; and, with the President, shall sign all contracts for the organization. The Secretary shall take and circulate full minutes of all Board meetings and distribute notices of meetings and vacancies to be filled; shall maintain current copies of the rules and policies as decided by the Board; shall provide these to any group applying for affiliation; and at the annual meeting shall distribute copies of any documents that have been revised during the preceding year. The President and the Treasurer each may authorize another Board member or dance producer to sign contracts on her/his behalf. Each officer may delegate her/his duties to another Board member. The Co-op’s fiscal year shall be January 1 through December 31. No part of the Co-op’s net earnings shall inure to the benefit of private individuals. The Co-op shall not attempt to influence legislation or participate to any extent in a political campaign for or against any candidate for public office. In case of dissolution of the Co-op, the assets of the Co-op shall be transferred to the Country Dance and Song Society or another 501(c)3 organization as determined by the Board. These bylaws may be amended by a vote of two-thirds of the full Board. A written notice of proposed amendments must be provided to all Directors at least 30 days before the vote; the notice must state the proposed changes.